For the islands near South Africa, see Prince Edward Islands. 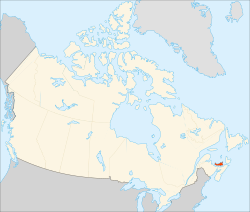 Prince Edward Island (French: Île-du-Prince-Édouard) is a province of Canada. It is the smallest of Canada's ten provinces. Most of the people on Prince Edward Island speak English. Prince Edward Island was named for the son of King George lll of Britain, and it joined the Dominion of Canada in 1873. This province is 224 km (139 miles) long and 4 to 60 kilometers (2.5 to 37 miles) wide. The capital, and also the largest city, is Charlottetown. Prince Edward Island is known for being the location for novels written by Lucy Maud Montgomery including Anne of Green Gables. ↑ "Land and freshwater area, by province and territory". Statistics Canada. February 1, 2005. Retrieved August 5, 2012. ↑ "Gross domestic product, expenditure-based, by province and territory". 0.statcan.ca. November 4, 2010. Retrieved February 23, 2011. This page was last changed on 9 November 2018, at 11:25.